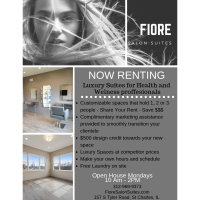 Saint Charles, IL, April 1, 2019 - Now open near the heart of downtown Saint Charles, Fiore Salon Suites is a state-of-the art luxury space provider for the beauty, health, and wellness industries. Each exterior suite is outfitted with a wall of windows to provide a sense of the the outdoors, while the interior suites were more purposefully geared toward practitioners who's modalities require a more quiet, zen-like space for their clientele. Aimed at hair stylist’s looking to take their business into their own hands and into their own space, Fiore Salon Suites provides completely customizable suites for you to rent individually or with others within your field. Similarly, real estate agents, small businesses, and medical professionals will all find Fiore Salon Suites to be the ideal place to host their office spaces. With an amenity-filled building that includes free wi-fi, two reception areas, and facilities maintained to take the stress of off renting, Fiore Salon Suites is appointed to help each space succeed.